It was the year 1849, and into the harbour of Stromness in the Orkney Islands a sailing ship carrying the Hudson's Bay Company's ensign slipped into berth among the forest of trading and fishing vessels. The winter winds were blowing down from the north, so the bundled figure by the rails stamped his feet for warmth and from impatience, for he was eager to get on with the last lap of his journey to Leswick, in the Shetland Islands, still farther north. It was the ship's surgeon, Doctor John Cowie, who was also the Company's agent in the old Shetland capital. He was anxious to be home, and could hardly wait to see his year-old son, Isaac. When the doctor climbed onto the stone quay in Leswick, his older sons threw themselves at his legs as he held out his arms to his wife and baby. The latter probably started to howl, wondering who this strange man was. But three years later when Isaac was four, he skipped along beside his brother and his lanky father as they went down to meet his cousin, Doctor Robert Cowie, ship's surgeon on the Kennedy Expedition in search for Sir John Franklin. Possibly the talk young Isaac heard around the fire that day was the first he remembered of the far-off, exciting "Nor'west"  and many more were the tales he would hear as company men home on furlough came to dinner at the Company agent's home. When he was around ten he began to read the books of R. M. Ballantyne  which you yourself may read today and his appetite for the roving adventurous fur trade life was whetted. But, "Schooling first, my boy!" applied then as now, and in his early teens, like his father, brother, and uncles before him, he was sent off to Edinburgh University to study medicine. However, in 1867, with two years volunteer service in the 1st Edinburgh and Shetland Rifles, two years Medicine, and eighteen years of his sixty-nine passed, he was bound for York Factory aboard the Hudson's Bay Company barque "Prince Rupert" with his Apprentice Clerk's contract in his pocket, and excitement shining in his eyes. This was the boy who jostled along in a buggy with his young friend Alexander Christie up the King's Road, the deep rutted, muddy trail we now call Main street, from the Lower Fort to Upper Fort Garry, taking almost as many hours as we take minutes to make the journey today. This was the young fellow of twenty, who, at Fort Qu'Appelle, bluffed a group of bragging would-be rebels at the time of the 1869-70 Uprising into believing that he, one old man, and a few women, had big guns and knew how to use them. When smallpox swept up to Red River from the Sioux Country in the south, and spread over its cover of death over the plains as far west as Edmonton, this was the surgeon's son who took serum from the arm of Pascal Breland's little grand-daughter (who had had the disease), placed it on a piece of window glass, and vaccinated everyone around the fort by nicking their arms, and rubbing in the serum; and who taught these people to perform this act on all they met in their wanderings. The result was that the Swan River District, of all the area for about a thousand miles around, remained free from the miserable and dreadful killer. As time went on and he became interested in the transport section of the fur trade, he experimented with double-decked York boats, and, with Chief Factor Roderick McFarlane, advocated an east-west route across the barrens which just this year the Canadian government has announced will be built. At twenty-four, he and Mr. Edward McKay, Interpreter, were made Justices of the Peace for the North West Territories in September, 1873, in recognition of their having warned the authorities of an intended conspiracy being hatched among dissatisfied Metis, not only with Indians within the Canadian border, but with Assiniboine and Sioux along the Missouri, who intended to capture Fort Qu'Appelle and Ellice, take the ammunition from these posts, raid the settlement of Portage la Prairie, and massacre the inhabitants of Winnipeg, while beseiging Fort Garry. This is what had happened. In 1872 Isaac was put in charge of Fort Qu'Appelle. This was after the reorganization of the Hudson's Bay Company under Donald A. Smith, and orders had been issued that no advances on trade goods were to be given to Indians on any account. These improvident people came again and again to the fort asking for the credit on goods which the company had extended to deserving natives for 200 years. In his book, The Company of Adventurers, Isaac refers to this incident: "These came to me individually and in parties again and again asking advances, which I was obliged as often to refuse. At last they got together and determined to come in a body to the fort to break into the store and help themselves. They had tried to keep their plan secret and take us by surprise; but we heard of it, and as we had no interpreter then who had the courage to interpret in a war of words, I rode out to the camp of Mr. Edward McKay, a man of education and bold as a lion, and asked him to help me next morning. "We saw the band of horsemen coming, all painted and plumed in warlike array, and Messrs. McKay, McKinlay and I were seated in the Indian hall as they trooped in and filled it to within a little space in front of our seats. Every one of them was a walking armory, each with Indian bow and quiver, many with Henry repeating rifles and revolvers, and all the rest with shotguns, besides tomahawks, scalping knives and war clubs. The most highly-decorated and extensively-armed of the bunch was the Saulteau, Tep-is-couch-kees-cou-win-in, that "Man in the Zenith," whose firewater had caused me trouble with the Young Dogs in 1868. He had been the leading spirit in getting up the intended raid, and before anything had been said, for they came in silence, I addressed him, saying we had heard that he had been trying to get the others to join him in helping themselves out of the store. "There are enough of you to do so, but the first man who attempts to break in I will shoot. Mr. McKinlay and I (we both had Winchesters in our hands) are ready to begin the moment you try to break into the store." Then, pointing at it, I said, "There it is Zenith, go ahead." As I challenged him Harper was just hoisting the flag, and, pointing to it as its folds flew at the staffhead, I exclaimed: "That is why we are not afraid of you!" The effect was magical. With one accord they denied having come to pillage, but merely to ask again the Company in kindness to enable them to leave for the hunting grounds with ammunition and tobacco." This was only one incident in many on the plains in those years. On another occasion Shaman Racette bragged to Isaac of a larger conspiracy that was being planned which Isaac reported to headquarters. Again from this book: "This Shaman Racette was the most notorious rowdy and bad man among the Metis hunters who frequented Fort Garry and the incipient town of Winnipeg. A description of him and his deeds would fill a highly sensational Wild West story book, and cannot be given here. But he, too, had been scorned in his attempt to obtain supplies from Mr. McDonald and had arrived at Qu'Appelle more determined than ever to take a leading part in the next raid on the settlement, for, having been run out of Red River to the American wilds before the troubles of 1869-70 started, he had, much to his chagrin, been a non-participant in them and the booty. Mr. McDonald had written me giving Shaman his well-earned bad character, and ordered that no assistance be given him at my post. But my good counsellor and friend, Alick Fisher, came and advised me it would be well for the peace of the lakes to get rid of Shaman by giving him what was absolutely necessary to start him off to the plains to hunt. Alick said that, although Shaman was a bad man and a rascal, yet he "acted square" with those who were not afraid of him and at the same time treated him kindly. So I took the risk of giving him a scaring and then giving him his hunting needs on my own account. He "acted square" with me, and in personally friendly and boastful spirit also revealed much of the plan of campaign being prepared for sweeping Canadian rule out of the Red River country, all of which, as in duty bound, I promptly communicated to headquarters." If you remember your dates you will know that the following year, in 1873, the North West Mounted Police was formed to handle the law in the West. 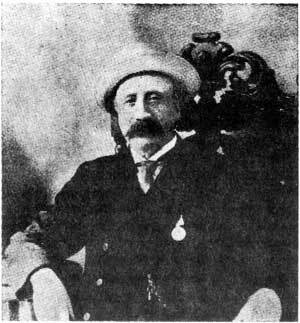 By 1891, Isaac had become a Junior Chief Trader, and had served at Forts Qu'Appelle, McMurray, Manitoba House and Isle a la Crosse. 1892 found him a citizen of Edmonton, where he soon became one of the first secretaries of the Board of Trade. He engaged in real estate and insurance, and had interests in a dredge that scooped up the Saskatchewan River mud which contained nuggets of gold. In that same year, he worked for the American anthropologist Dr. Franz Boas, and sent to the World's Columbian Exposition an excellent collection of Plains Indian material from a hunting lodge  clothing, weapons, and utensils, right down to twenty-seven varieties of Indian medicines, with notations as to how and why the medicine men used them. The Columbian Exposition awarded him a bronze medal, but, because he could awaken no interest in this valuable offering in Canada, it reposes in the American Museum of Natural History in Chicago, for he knew its worth and felt it should be held for future generations of students in a public museum. When he came to Winnipeg in 1901, he began writing articles about people and events of the days when the West was called Rupert's Land, and some of these were gathered together in a book called The Company of Adventurers. For years he acted as secretary for an association called "The Pioneers of Rupert's Land", and fought tooth-and-nail over what he believed to be an injustice arising out of the transfer of Rupert's Land to Canada, whereby many early pioneers who should have had land grants did not receive them. He bore the cost of this struggle from his own pocket. Because he believed that a British principle had been abused, the trips to Ottawa on thin rations, with poor hotel accommodation, and days of waiting to see various ministers of the Dominion Government, were worth the effort. Victory was at hand when Prime Minister Borden finally agreed to have the legislation reviewed; but in the next election the government was defeated, and the new Prime Minister, Sir Wilfred Laurier, chuckled, shrugged his shoulders, and said with a wave of his hands, "Why you can try  it's a free country!"  and there the matter rested when cancer overtook the man from the Shetlands. He died at Winnipeg in 1917. So ends the story of a fur trader. You may think, "He did a lot of things besides trading furs." Yes he did  which is what I wanted you to realize. And I want you to further realize that Isaac Cowie was one of literally dozens of Hudson's Bay Company men of the last century, who gave so richly and imaginatively to our heritage. They did their work with gaiety and zest, and a confirmed belief that difficulties are things to go around, under, over, or through  but that you must never be stopped by them. Isaac Cowie was my grand-sire by blood  he and his companions of the fur trade are yours, by birthright as Canadian citizens. Therefore your daily thought should be, "Unto whom much is given much shall he expected." Let's give with zest  and have adventures while we do it.